Whatever I actually uttered in rusty Spanish while attempting to say "Change for smaller, please" was good enough. With a sympathetic expression the young Moroccan man at the Tetouan corner currency exchange office promptly turned my 20 dirham (Dh) note into a fist full of coins without charging me a commission. 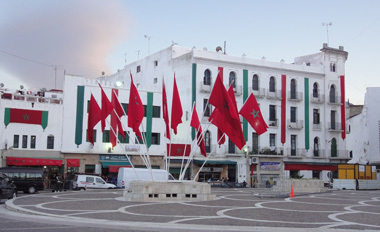 The many flags signaled that the king was also visiting Tetouan. I knew when the Moroccan ATM dispensed 100 Dh notes (about $12) that we wouldn't be able to buy bread for lunch without something much smaller. It took 3 of the ATM's associated bank employees ducking into the back room to come up with 20 Dh notes when I asked for ten 10's, but even the 20 Dh note was too large for the man selling bread and espressos in unwashed glasses. He sent us off with the bread in hand, communicating with gestures and a smattering of French, Spanish, and Arabic that we needed to come back with coins. Entering Morocco through the back door, through the North African Spanish possession of Ceuta, had worked like a charm: it had allowed us to evade the now-iconic hustlers of Morocco's main entry ports and instead interact with the decent people of the country. The shopkeeper gave us the bread, trusted us to comeback with the change, and charged us what we later learned was the fair-market price when we returned a few minutes later. The currency exchange man took pity on our undisclosed plight and provided us with the needed coins and a generous smile. 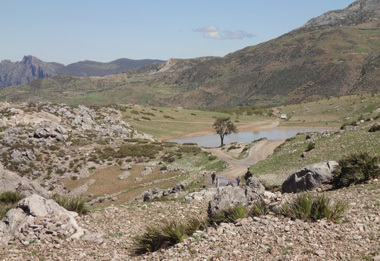 It had been the same at the land border when crossing from coastal Ceuta (inexplicably pronounced "Thel-ta") into Morocco. No haranguing or unpleasantness as we walked across the border and cleared passport control, customs, and looked for a shared taxi for the 30 minute ride into Tetouan. The cab driver was pleasant and chatted a bit in English with us, Spanish with the man sitting next to Bill, and Arabic and French with the guy in the front seat. He quoted us less than what we understood to be the going rate for the ride and gave us a fair exchange rate for our payment in Euro's. 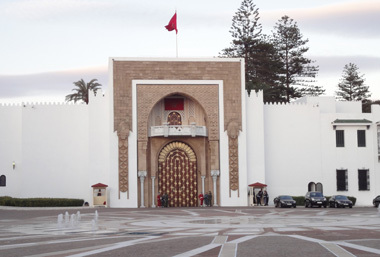 Tetouan Palace: like much of Morocco, wasn't much to look at. I was thrilled that as we navigated the narrow sidewalks of Tetouan in search of our pension, and later when looking for bread, that none of the Islamic men were doing the sexual harassing bumping I experienced in Egypt. We had learned during that, our first visit to North Africa, it was critical for devout Muslims to not even accidentally brush against infidels. We were mentally exhausted at the end of our days on Cairo's sidewalks as we concentrated hard on weaving in and out of the dense crowds without contaminating any one with our touch while we dodged potholes in the sidewalks. The hard-won skills kicked-in automatically on our first day in Morocco after having been reinforced by a visit to Tunisia in 2008 where the practice wasn't quite so critical. As the days passed, we learned that most Moroccans were even more relaxed than the the Tunisians about touching. It was only as the sun was setting on our first day in Morocco that we heard the familiar North African chants: "My cousin lives in London....I am practicing my English...Don't you remember me from this morning....." Fortunately on this our third visit to the continent, we could dismiss the wind-up to a sales pitch without armoring, without bringing up our defensiveness. Though the chattering men followed us longer than we wished, they failed to tarnish the glow created by the neutral to kind reception from their countrymen during our first hours in their country. 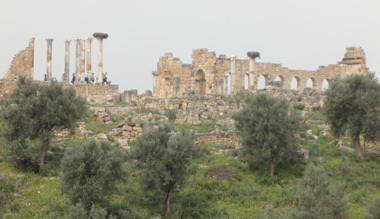 Roman Empire Volubilis is the only significant ancient site to see. Of the 3 North African countries that US citizens can readily visit: Morocco, Tunisia, and Egypt, Morocco had fallen off of our list of "Maybe See" destinations several years ago. It was the growing consensus formed by talking with other travelers that the merit of the few historic sites was grossly overshadowed by the extreme pressure created by the touts and con men. But the urging of a Seattle cyclist we met in Montenegro last year who was living in Morocco was enough to convince us to give this former French Protectorate a try. All of the warnings sprinkled throughout Lonely Planet Morocco like "It's a lawless town, don't stop here" and "Virtually everyone in the city is on the make...." gave us second thoughts. But we'd been in search of a new, reasonably warm place to be in March and there was a sense of closure in visiting the third of the three North African countries available to us so we "pressed on regardless". mental collection of other older forms. Though doing the trip planning for Morocco had raised my eyebrows more than once as I read about "no-go" zones and generally terrible budget lodging circumstances, I was immediately reaping rewards from the North African adventure as we spent an afternoon visiting Ceuta, which is opposite Gibraltar. There is nothing that enhances my understanding more than be 'being there'. Having been to Gibraltar and looked across the Mediterranean to North Africa and now being in North Africa and looking at Gibraltar changed everything for me. Questions and images surged as the freshly renovated, little Ceuta museums spoke of the other ancient Phoenician trading ports we'd visited; as we contemplated Casablanca's odd, sort-of neutrality in WWII; and we pondered the effects of the blending of the Atlantic and Mediterranean waters at the Straits of Gibraltar and at Ceuta. Morocco might be short on choice historical sites to visit but even before jet lag cleared our journey was paying dividends by deepening our understanding of history and the world on many levels. We immediately and repeatedly confirmed that Lonely Planet was exactly right: Morocco isn't a particularly budget-friendly country to visit, primarily because of the lodging costs. We generally fall in the high-end of what their authors consider "Budget" travelers, which usually allows us to hold-out for a private bathroom and something pleasing. A couple can tour Morocco on the cheap if dormitory rooms, cold showers, shared toilet facilities, threadbare furnishings, and 'spotty' cleanliness are acceptable. Such accommodations are readily available in the US$20 range for 2. A private bathroom bumps the price to at least the $45 range, though there may not be hot water at the sink or heat in the building. Holding out for heat, even if meager, would usually push the price to the $70 range or more, though that price still might not buy an outside window or a sense of comfort. Frustratingly, even with a dozen or more abodes in a city, the lodging options often clustered around the $20 and $200 brackets with only a few choices in the middle. Lonely noted that the under-$100/night places in Chefchaouen all lacked heat, which was taxing on the several rainy days we were in the mountain town. Nothing dries in a damp, 55° room, including our quick-drying raingear. Beads of water stayed beaded overnight and we knew that doing laundry was a looser as nothing would dry. The 2 dim, energy efficient fluorescent light bulbs made it hard to read at night and of course did their job by adding little warmth to our room. We wore our knit caps in bed and any time in the room to ward off the chill. By the time we left town, garments that hadn't been out of our suitcases had become damp. In one town I selected the single, more upscale budget 'riad' option gambling that it would have heat. Indeed, a portable heater was at our disposable, which kept the nighttime temperature from dropping too low. Due to a booking error by the owner, we were upgraded from the $70 room to a $95 one, which was still barely tolerable for me. 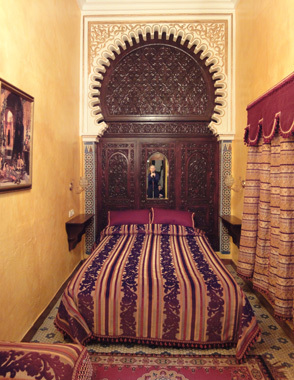 Being a traditional Moroccan medina home design, there were no outside windows or ventilation in our room or the building. Lodging interiors were often highly decorative but not comfortable. The door and 2 windows of our nicely renovated $95 room opened onto an interior courtyard that was now closed-off to the outside air. Undoubtedly that made our room temperature far more comfortable, but the cigarette smoke, potent cleaning chemical fumes, and late-night revelry noises all made their way into our awkwardly proportioned room. And it didn't take long for my alarm bells to sound as our second floor room definitely qualified as a fire-trap with a single, partially obstructed exit stairway to the ground floor. The images in my mind from the recent earthquakes in Chile and Haiti also focused my attention on the lack of a quick way from this medina building to wide open outdoor areas should there be such a disaster here. A week later, after struggling for over an hour to select between a string of $70 options in Fez that all had unsettling reviews, I jumped at the chance online sighting of an Ibis Hotel--a chain that now owns Model 6. For $60/night for 2 we knew what we'd be getting because the Ibis brand is highly (though not perfectly) standardized. With Ibis, our $60 bought novel amenities like soundproofing, heat, unwavering hot water, brightness day or night, fresh air, and general comfort that I suspect were often only available in the $150-200 range in home-grown Moroccan hotels and guesthouses. 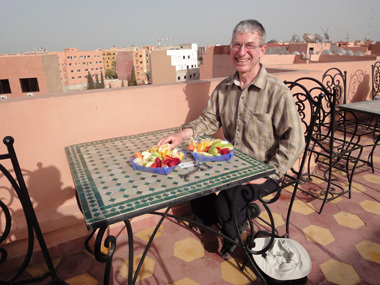 We'd happily stayed in Ibis Hotels throughout Morocco if it had been an option as the lack of comfort, even in our Rabat apartment, eroded our sense of wellbeing throughout our entire stay. From our first hours in Morocco until the end of our stay we thought it a shame that the Moroccan people were getting such a bad wrap from of their medina touts. The reputation of the touts precedes them by thousands of miles but we didn't have much trouble with them and we found the average man-on-the-street in Morocco to be very kind. 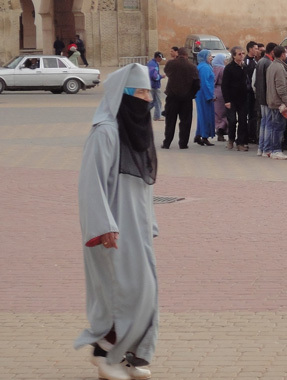 Unfortunately women in these North African Muslim cultures don't get much opportunity to show their colors, so our direct experience was almost exclusively with men. But many, many of the men we interacted with clearly had kind hearts and gentle souls. 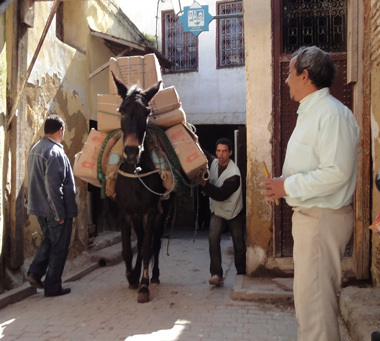 Heavily loaded donkeys in Fez's medina took the right of way. I was so taken with the careful touch of one man in the Fez medina as I was about to be run down by a loaded mule in a narrow lane. I hadn't been quick or extreme enough in plastering myself to the wall as I arched over a low shelf of merchandise. The seated shop keeper gently pressed my protruding backpack into me and me into the wall just enough more so the donkey could clear. I was so impressed with his precisely calibrated touch--it was just right to feel helpful, not so much as to feel intrusive. I had to wonder how men in a culture that traditionally prohibited touching women in public learned such appropriate touch with strangers as I'd had much rougher and less effective handling by men in western cultures when they were trying to be helpful. But as the days passed I realized that Moroccan males grow up almost constantly touching other males. Adult men hold hands; teen males sit in each other's laps; and boys or men walking with one guy's arm draped over the other is a common sight. Minutes after almost being run-down by a donkey coming from behind, a young man briskly pulled me with his gestures into the entrance of his tiny kitchen as this time I was about to collide head on with another speeding donkey. His focus was on being helpful and he was well-practiced at it. In addition to rescuing us from the fierce donkey traffic in the Fez medina, several other shopkeepers offered in English "Where do you want to go?" when we were flummoxed by our tiny map. They gave us clear directions with no sales pitch, which was very appreciated and unexpected. In Meknès, an English speaking man crossed the street to help us when he saw that we were unconvinced by the directions given by a woman whom I had asked for help. At the urging of his sister who was with him, they walked with us for about 10 minutes until the trophy supermarket was in sight. He gave us his cell phone number should we need additional help and warned us about street vendors raising the price once they knew we were foreigners (which was hardly new information). Repeatedly men were looking out for us, pointing us in a direction, giving us a directing nod, or otherwise making us feel welcome and reassured on the streets. Bill was taken aback by the friendliness of the otherwise 'all-business' bus driver when Bill asked where the toilets were on one of our intercity treks. The driver put his arm over Bill's shoulder and they chatted in French a minute or 2 as the driver was impressed that as an American Bill knew some French. 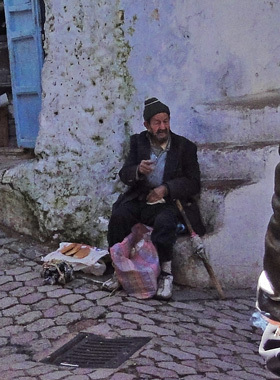 And the eyes of a man eking out a living in the Chefchaouen medina lit up as he and I played a quick game of alternately saying "4" in the languages we each knew. His big grin had me smiling for hours as I was touched that despite his desperate lifestyle, he was ready for a quick bit of linguist play with an outsider. Every day we found ourselves smiling at the kindness, the generosity of the Moroccans we encountered--especially because we almost skipped their nation because of a very different reputation. It hadn't taken long with the guide book to realize that the walled medina of each city was the bulk of what Morocco had to offer the average, non-beach going tourist. 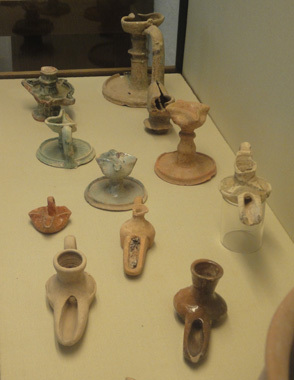 The history and archeology museums were small with meager exhibits and much of the grander scenery was challenging or impossible to access without a car or 4 wheel drive. Though fellow tourists spoke of getting "medina'ed out", each had a story to tell. There were recurring sights in all of the medinas that spoke of low-tech lifestyles: men with spools in hand twisting thread or cord that was stretched out on a passageway wall; children with one or 2 rounds of cloth-covered flat bread heading to the baker's oven; men seated at manual typewriters ready to generate hard copy; and men laboring in tiny workshops with no artificial or direct natural lighting. But each medina was a distinctly different experience with some having large areas of merchandise targeted to bus-loads of tourists while others were strictly for the locals doing their daily shopping. 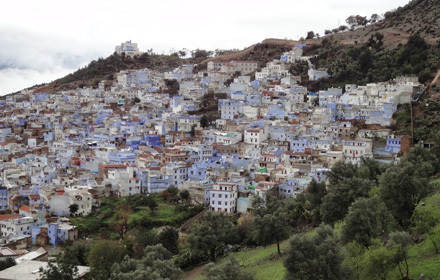 Chefchaouen is known for its blue hue. Tetouan's medina, our first in Morocco, felt more historic than those we'd seen in Egypt and Tunisia because a higher percentage of Tetouan's vendors were the product producers as opposed to middlemen selling other people's goods. Live chickens and their eggs; soaked but uncooked chickpeas; and bundles of fresh cilantro and other greens were presented for sale in the maze of shops along side men repairing ancient TV's and blenders. Our experience of the Chefchaouen medina was colored by the weather--the first afternoon we wandered around in a downpour and the activity level was decidedly low. The next day was the first good break in months of too-much rain and it was the elderly sunning themselves for warmth that were the most prominent sight. Medinas are designed to be cool in the summer heat but in the spring they are nasty-cold. The temperature seemingly drops 10°'s your first minute or 2 into a medina and once in the depths, you can feel even colder air seeping out of the homes and shops. Jewish refugees that arrived in the 1930's painted the white-washed walls blue and the Islamic Chefchaouen residents perpetuated the decorating change. Seeing all the blotchy tints of blues on the walls was one way of knowing you were in Chefchaouen. 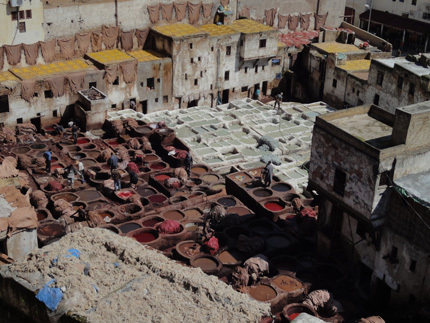 Eye-popping dye pots & drying hides at Fez's toxic tanneries. Fez has a population of 1 million and its medina houses about 150,000 of the total Fassis. The medina carpets the 2 hillsides flanking a fast-running river and is the largest car-free urban environment in the world. We saw donkeys in all of Morocco's medinas but donkeys take the right-of-way and set a brisk tempo in Fez's. Trucks stop at the gates to the medina and donkeys and men with hand carts run materials in and out of the labyrinth of narrow and dead end streets. Dodging donkey poop on the pavers while being alert to donkeys approaching from both in front and behind made navigating Fez's medina a high-stress activity. Never mind tracking where you were going or what else there was to see, the donkeys defined our experience there. Fez is also noted for its tanneries that have existed since medieval times and use technology similar to that of the Romans. Paying a tip allows one to peer out from a leather shop's balcony to see the spectacle. Fortunately for us the winds were just right and ours was mostly a visual experience instead being a visual experience punctuated by a too-strong olfactory one. We were captivated and revulsed by the sight of men stomping hides in toxic brews that created significant health hazards despite the use of all natural materials. Unfortunately 'natural' does not necessarily equate with being non-toxic. This larger, upscale 'hole in the wall' workshop had a TV & lighting. 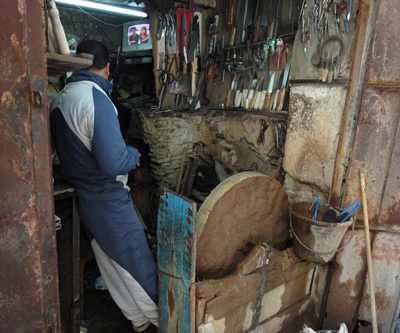 It was in Fez's medina that we learned more than we wanted to know about the occupational health standards of the country. In addition to the unhealthy tanneries, we saw many men in the tiniest of workshops. "Hole in the wall" was an expression from my childhood that took on new meaning in Fez. Some of these men literally climbed up and into a cabinet-sized, upper hole in the medina wall to settle-in at their workbench where everything was literally in arm's reach. The Meknès medina reminded me of that of Tunis, Tunisia in that it had a higher percentage of cheap imported manufactured products for sale and fewer local goods and products. Unlike most other medinas, the farmers market also spilled outside the high walls and consumed the adjacent city streets. But it was other things outside the wall at Meknès that held our attention, like the craftsmanship on the impressive Bab el-Mansour gate and at a shrine. Overall, Marrakech's medina had a decidedly modern feel to it. Little of it was a cold, dark labyrinth but instead many of its wide streets were open to car traffic and where cars were restricted, scooters had free rein. Bus loads of tourists were evident in every direction and the locals were clearly dancing to a more western beat than those 'up north' in more conservative Fez or Meknès. A private meeting with a fortune teller in Marrakech's medina. Marrakech's medina has a huge open central plaza that is recognized as a UNESCO heritage site, in part for its traditional snake charmers, fortune tellers, and story tellers. In the jumbled alleys there were men with a single dye pot tinting hanks of wool yarn and woven scarves; brass workers pounding metal; and men powering tiny Neolithic era lathes with a wooden bow and length of cord while holding a metal cutting tool with their feet and other hand. Whatever the cause: the newer construction of the medina in the 1600's; the fact that Rabat is the political center of Morocco; or it being a seaport, parts of Rabat's medina felt distinctively different to us. Seeing the chicken vendor smiling down at a cat stretching its nose towards him and the easy-going engagement between the vendors and their customers gave some of Rabat's medina a friendlier, more neighborhood feel. Other medinas seemed to have a harder edge, either because of the pursuit of tourists as in Marrakech or the fast tempo driven by heavily laden donkeys in Fez. But in some areas Rabat's medina scene had more of a coffee shop or neighborhood park feel to it. For the most part we preferred to shop at the supermarket but in Rabat the medina was the place to go for our daily dose of fresh strawberries and oranges. Little Imlil had no medina but venturing to Imlil, into the High Atlas Mountains of central Morocco from Marrakech, was my big trip planning gamble: it would either be the literal and figurative high point of our trip or the subject of great future stories because it was a disaster. Spending 3 nights in an unheated building at 5,700' in mid-March was the first known roll of the die. Our luggage completed its trip to our Imlil guesthouse by mule. The unexpectedly good start in just getting to Imlil portended the future and we were thrilled when we arrived. The anticipated 2-3 hour journey squashed into 2 different vehicles took a bit more than an hour and we rode in the same grand taxi the entire way from Marrakech. The driver invited us to pay for a 3rd seat in the back and he took off without filling the 4th. That meant for $20 we had the back seat of the taxi to ourselves--something for which the young German couple we later spoke with paid $30. No matter to us that convention had it that there were 2 other people crammed in the front seat with the driver. Fortunately the last 10 miles on the windy, single-lane mountain road wasn't nearly as death-defying as others had described and when the our cab pulled into the the taxi corral just past the one filled with donkeys, I felt like I was in a fantastically exotic place, like the Himalayas. All that seemed to be missing were strings of colorful Tibetan prayer flags flapping in the wind. The winter's light snow pack was still frosting the craggy, steep peaks flanking Imlil and competed for our attention with the North African spin on a wild-west town at street level. Closet-sized shops lined the street with an unlikely assortment of merchandise including car parts, used hiking boots, wooden chairs, and hand-crafted souvenirs. The background noise of rushing water was punctuated by sounds ranging from an ever-changing mix of call to prayer; Arabian music blaring from a radio; squeals from a school-boy's soccer game in the street; and the unsynchronized mix of barnyard sounds from chickens, donkeys, and lambs. Imlil was literally at the end of the road into the high mountains. Wide-eyed and spell-bound, I was mesmerized. Faded memories from a sprinkling through the decades of stories, documentaries, and photo displays of far-away mountain places came to life before me as we walked uphill on Imlil's lone street, which was literally the end of the road. If Imlil delivered nothing more over the next 3 days, this surreal moment that had stirred me to the core would be enough. Reading between the lines is always a time consuming part of trip planning and I spent hours trying to develop accurate expectations from fleeting references when reading about lodging, museums, and other sightseeing possibilities in Morocco. Piecing together scattered bits of information about Imlil had piqued my interest more than any other place in the country as it seemed like it had the potential to crack-open the door to a range of new opportunities. 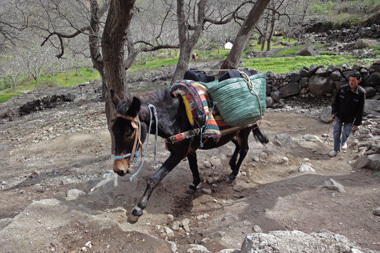 After reading repeated references to trekking with mules and muleteers in Morocco, I intentionally positioned us to investigate this unfamiliar style of travel. We like hiking above tree line and would love to do extended hikes, but we are just as clear that we don't want to carry heavy packs. We know too much about aging and anatomy to subject our knees and spines to the required stresses of backpacking: discs compress and dry-out with aging without additionally squashing them under significant external weight. 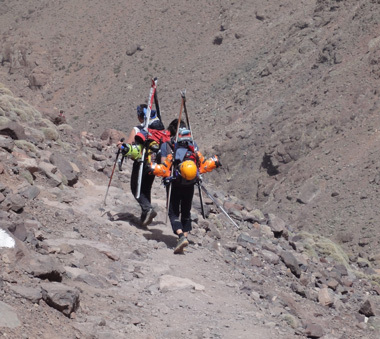 But trekking in regions like Morocco's mountains where pack animals were both affordable and the norm would open up a host of hiking experiences to us. We couldn't wait to get out for a walk our first afternoon in Imlil. In addition to selecting a small guesthouse owned by a guide and trek organizer, I decided that we'd break-out of our rigid practice of preparing our own evening meals. We'd sign-up for the 'half-board' option and hope that other English-speaking guests would do the same and thereby accelerate our learning about supported trekking while visiting Imlil. I quickly looked like a star in gambling on 2 days of hiking from an Imlil guesthouse as it could hardly have gone better. We felt like we turned in our chits for the year as the hottest day of this March in the area was one of our 2 hiking days in high Imlil. Many years there could still have been snow on the ground at Imlil and our hikes could have been a wash-out altogether or been restricted to going downhill instead of up. But the lingering snow on the trails was above our turn-around points each day (about 9,000') and we had comfortably warm weather and cloudless though hazy skies. No rain was in the forecast for our stay and the sun added some warmth to our room each day. The English-speaking guesthouse owner wasn't around much so we failed to learn about supported trekking from him but it turned out that he wasn't needed for our education. Just being on the trails and seeing the mules and muleteers fed our right-brains (the intuitive side) with loads of information about what it would be like to trek with them. Clearly we wouldn't get much chit-chat from the hired hand, but we would be relieved of the burden of carrying sleeping bags, food, and water. Some of the mountaineers skied part way down from the summit. 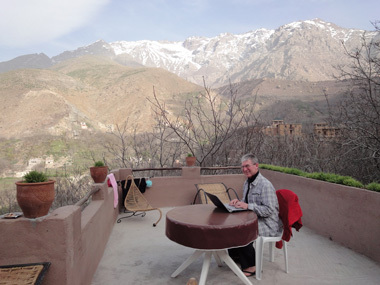 Seeing several supported or guided trekkers on the trail laid the ground work for our education on this new topic and at dinner our third and last night in Imlil, a British couple fresh off the track filled-in the details. How they arranged it, what they ate, where they slept, how route changes were negotiated on the fly, and their obvious satisfaction with this their first supported trekking experience gave us what we needed to know. I doubt that we will return to Imlil or even Morocco for such a trekking experience but we left the de facto base camp for assaulting the Jebel Toubkal peak feeling like we were informed enough about the general culture of pack animal hiking that we could shop for such a service on another continent with confidence. The simple family-style dinners at our guesthouse delivered great mealtime conversations like we've rarely had as travelers. There was a single seating for dinner each night around low tables and though some guests dined 'in the village', we had delightful interludes with 4 or 5 other people each evening. The menu didn't change but it was a different mix of folks each day. Unexpectedly, the guesthouse marketing on English websites and in guide books resulted in all of the guests speaking more than a little English. There were at least 2 Brits at the table every night and 1 evening there was another US couple with the husband being from Lake Oswego, Oregon--a suburb of Portland. One couple was Polish though they'd been living in England for 5 years, 3 people were from Germany, one was graduate student from Finland, and a middle-aged Spanish mountaineer rounded out the dinner guest list. I was fascinated by the conversational dynamic as there was uninterrupted, playful talk the entire evening each night. The guests covered the spectrum from dedicated mountaineers who were only there to reach the peak of the tallest mountain in North Africa, to committed day hikers, to 'let's take a look' travelers. I was stunned at what a delightful event evolved each evening with such a mix of nationalities, ages, and motivations for being at the mountain village. We long ago abandoned eating out when traveling in hopes of connecting with others as it never happened. Instead, we found that the more satisfying chance connections happened literally on the road or in campgrounds. So, along with having our eyes opened about a new way to trek, our Imlil guesthouse dining experience will have us reading between the lines for similar potential social dynamics at future guesthouses. Heat in the room; a reliable stream of hot water from the shower head; a big window in our room looking out at the mountains; and staff that spoke enough English so that when I asked for a weather related website for the area that the man didn't come back with "You want to pay now?" would have made it better but we were nonetheless absolutely thrilled with our mountain experience in Imlil. 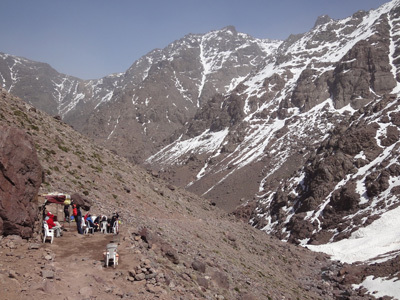 Given the unfamiliarity with the country, the scant information available to us, and the unpredictability of the weather, our side trip to the base of Jebel Toubkal will be counted among the triumphs of 2010 trip planning. Back in Marrakech from Imlil, "confining" was the word that popped into my mind as our 16-day tour of Morocco was coming to an end. Once again I was feeling trapped in our small hotel room and that echoed our generally "boxed-in" feeling while in Morocco. Indulging in our afternoon fruit plates on the terrace was soothing. There was single small window in our room that I could look out if I twisted around some furniture--but at least this room had a window as some had had none. Too little artificial lighting that left me squinting as I looked for a misplaced item and kept me restless as I struggled to create a pleasing place to sit to read added to my disquiet. And for seemingly no good reason, I'd been kicked off the hotel's roof terrace where I'd found more physical space to do my morning exercises. Other terraces had been limiting because I was too visible to the neighbors for such odd behavior as exercises in semi-public. Unheated rooms on the very cold days and a complete lack of ventilation in other rooms conspired to leave me feeling edgy in when indoors in Morocco. On the streets we needed to be "proper": we needed to keep our eyes scanning the people ahead to avoid touching but without ever making eye contact. Intense congestion in the medinas, an awkward mix of tempos and right-of-way conventions on the sidewalks, and no regard for pedestrians on the streets meant there was no ease when out and about either. And with few exceptions, the public parks we'd found in Morocco didn't foster the expected sense of calm or spaciousness. Everything in the parks was usually damaged or wanting: the pavers, the retaining walls, and the landscaping. The sight of the many sickly cats and the smell of stale pee added to our distress when in public areas. Even the high trail at Imlil had souvenir & overpriced mint tea shops. It seemed indoors or out, in public spaces or private ones, it was hard for either of us to feel at ease, to feel comfort in Morocco. The cramped, dimly lit, often poorly ventilated rooms combined with the disintegrating nature of the public spaces to be perpetually agitating. The sense of confinement had us often going to bed tense and sleeping fitfully most nights. Our peace came from the few hikes we took. We relished the openness, the breezes, the brightness of the light. At last we could unravel the subtle tension that was building in our tissues and let down our guard for longer intervals but even then we were never alone; even then we had to abide by the local cultural conventions of modesty and concealing our eating. On hikes in the northern reaches, young boys came out of nowhere wanting to sell us marijuana and adults commuting by foot crisscrossed our paths. 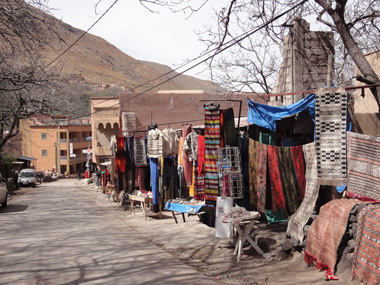 At Imlil, there were pestering vendors positioned on the trail to our guesthouse and on the main path up the mountain. We hoped that our Easter holiday layover in a Rabat tourist apartment would allow us to deeply relax while in Morocco, but even that failed. The inability of the owner to completely correct the butane gas leak, the lack of heat, and the unsettling layer of scum or whatever it was on the linens, furniture, and dishes made it hard to let down our guard, made it hard to not feel confined by even our more private, more spacious surroundings. Looking back on our stay in Morocco while still there had me longing to photograph without being seen. If I could photograph truly on the sly, my 2 top subjects in Morocco would be the timeless-looking people in the medinas and the hands of men when interacting with other men. We felt confined by the culture while in Morocco but the in medinas everyone was physically confined. But it wasn't the confinement but the depth and breadth of visual experiences in the medinas that took our breath away with every visit. For white, middle class Americans, being in the medinas is like visiting an alien world. Words can't capture all of the shocking details that are seen in a fleeing glance into a weaver's room or a knife sharpener's corner, one needs the photos that can't be taken. The uneven surfaces of the medina walls are centuries old and the little nooks where people spend their lives doing tedious, often dangerous work appear just as old. The tools and technology are or appear ancient; the individuals look hundreds of years old; and the unimaginable image is repeated hundreds or thousands of times in the medina by dozens of professions. And yet a polite tourist cannot capture these images with a camera. The dimness of the unlit workspaces require a flash; the busy, narrow alleyways prevent composing the shot; and few want to be photographed. Oh to be invisible, oh to be able to take hundreds of stealth photos to capture the sights that are simultaneously fascinating and horrific because of the lifestyle and the presumptions that they reflect. Equally alien in our culture as the medinas is the sight of men touching other men the way they do in Morocco. I was fascinated by the long messages seemingly being sent through the hands of these men: "I wish you well; what a time you have been having; isn't that swell; and let's talk about this again" were what I could imagine and yet the habitually prolonged touch suggested a much deeper story. A pair of robed, middle-aged or old men standing chatting would often be holding hands at the fingertips by the time a conversation drew to a close and they might walk away together with this light grasp of each others hands. On the train, one man had his elbow resting on the table with an upturned palm that bounced to punctuate his speech and soon his conversation partner had his forearm resting across the other man's forearm in the same palm-up position. This crossing of forearms was sustained for many minutes as the congenial but animated conversation continued. I was also taken with the loving touch of fathers with their preschool daughters. The little girls were stroked, kissed, cuddled, and looked at eye-to-eye when they spoke. Like with other men, these dads were fully present, fully connected when out-and-about with their little girls and the glow on the little faces reinforced how familiar and comfortable it was. I would love to have a photo collection of the tender, public touch of the many men's hands we saw as this was one of the more intriguing sights in a country short on visual interest. Pleasant but not dazzling scenery in the Rif Mtns. We didn't have high expectations of Morocco and were satisfied with it as a warm spring destination before launching into our 2010 European cyclotouring season. But Morocco is way down on my list of recommended countries to visit and we are unlikely to make a return visit. It's not spectacular, fun, or relaxing but it is intellectually stimulating and thought provoking. Our visit did give us a deeper understanding of the challenges of poverty in a developing nation, the economics of modernization, and the politics of Middle Eastern/North African monarchies. If you are bent on visiting North Africa, Morocco, especially entering as we did from Ceuta and Tetouan, is a gentle introduction to the continent and being in an Islamic culture compared to visiting Tunisia or Egypt. But as a tourist destination, Morocco is low yield. It's very short on developed historical sites and to borrow a phrase from a fellow tourist/historian "Morocco lacks a culture of preservation" as is reflected in the thin museum exhibits. In addition, the natural beauty covers a narrow range of visual experiences. Medinas are the big tourist draw (and the beaches, which we did not visit) and each medina is different but Morocco is a far off destination to do so little. As we traveled, I found myself summarizing our moments by saying to myself "We are experiencing the culture." When one has an excess of time to travel "experiencing the culture" is enough but for most Americans with 2-4 weeks annual vacation time, Morocco falls quite short in creating a rich and rewarding journey. Morocco doesn't pencil-out from a cost standpoint either. Transportation, bread, and local seasonal fruit are cheap, but for what you get for the price, restaurant meals and lodging are disappointingly expensive. On average we spent a little less for lodging than when in Europe but the quality and level of comfort was substantially and consistently lower (more about this topic in "Country Details"). A man selling a few pieces of bread. 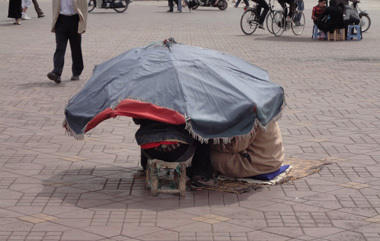 Morocco is definitely a poor country with signs of poverty always before the traveler, which in itself is wearing. The meager existences of the many dirty, scrawny people were underscored by those eking out a living by selling a 10-pack of tissues, a pack of cigarettes, or a few pieces of bread. Many others sat for hours on end with blank stares and a hand extended to receive the rare gift of a coin. Dozens of blind people tapped along the streets with a wooden staff in 1 hand, the other extended hoping for a donation; the disfigured sat on the ground and displayed their damaged and malformed limbs; and boys that should have been in school roamed the streets with simple shoe-shine kits in hand while the men with more supplies and a chair staked out turf under a tree. The desperate look of many of the people was reflected in the crumbling infrastructure and the disintegrating city parks. Most of the parks we saw were pathetic, though we welcomed them as a place to sit for a few minutes. The Cyber Park in Marrakech was an exception: it was fresh, beautiful, and well-groomed when all the rest we had seen to that point were repelling because of the lack of maintenance. "Why the difference?" was answered when we exited: the Cyber Park had 15 Information Technology sponsors, including IBM and HP. The old palace grounds had been spiffed when free internet kiosks were sprinkled throughout the park several years ago. It reminded me of the only really nice public space we found in Tunisia, which also had been funded by outsiders. In the case of Tunisia, the outsider had been the Prince of Monaco. While I felt under significantly less social pressure on the sidewalk as a woman in Morocco, compared with being in Tunisia or Egypt, several young women travelers confirmed that they were quite uncomfortable when not accompanied by their male friends. A Finnish woman majoring in women's studies had been reduced to corralling a fellow male student to be her companion when she wanted to travel in Morocco. She found that in this conservative country she was better off being half of an unmarried couple than for her to be alone. And she was still smarting from her loss of independence after discovering she needed to heed the warning to never go out with less than the company of another woman. A reminder of the traditional strategy for women. The most notorious problem with being in Morocco--haranguing by the touts--was a non-issue for us. Compared to Tunisia and Egypt, the Moroccan touts didn't seem to have their hearts in the game. We were pestered some, but not harassed. The offers of medina guides and invitations into merchant's shops occurred, but we could run the short gauntlets and leave them behind whereas in Cairo they tailed us. And only once were we nagged for baksheesh, or payment for a 'service' that was not requested and was of little or no value. These annoyances were the reasons we almost didn't go to Morocco and the bad behaviors didn't materialize enough to matter. Click on our homepage "Country Details" sidebar and then open the "Morocco" file if you'd like to know more about our itinerary, the mechanics of navigating in and between the cities, and some of the other challenges of visiting the country. 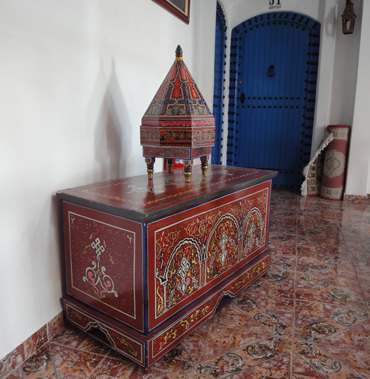 Unlike some of my Country Details files that are mostly lists of websites and hotel names, the Moroccan file has more cultural-experience information interlaced with facts for the potential visitor. The long Easter holiday, which increases demand for lodging on both sides of the Mediterranean, will be over in a few days and then we'll return to Seville, Spain to pick up our bikes. After a few days spent on the annual bike maintenance work which will be completed with parts brought with us from home, we'll be heading west by bike towards Portugal, a country we've never visited. Depending on the weather and whether or not Portugal dazzles us, we'll spend 1-2 months there, meandering generally north.